This is true of our relationships, our families, our decisions... heck, even our cooking and baking. The problem is that so often in life, our timeline doesn't seem to coincide with our ideals or our desires. In The Wedding Planner, Jennifer Lopez's character named Mary asks another character this question: "Have you ever loved someone but the timing was all off?" I feel like that statement could be used to summarize the majority of the storylines that intersect in "The Crawl," New Girl's most recent (and stellar) episode. The premise of the episode is pretty simple -- the group agrees to accompany recently-dumped Nick on a bar crawl. Everyone knows the reason he's doing this (no one vocalizes it as much as Winston does), of course: he's trying to distract himself from his recent break-up with Kai. But reluctantly, everyone agrees to participate in the crawl. So Nick, Jess, Ryan, (eventually) Schmidt, Cece, Coach, and Winston go bar crawling the night away and encounter issues as they do. "The Crawl" is structured as almost an entirely group-centric story broken out into smaller pieces. I hesitate to label them as A/B/C/D stories because the episode itself was really self-contained. So instead of structuring the review as I usually do, I'll break out each of the stories these characters had and discuss how the theme of timing played into them in terms or relationships. 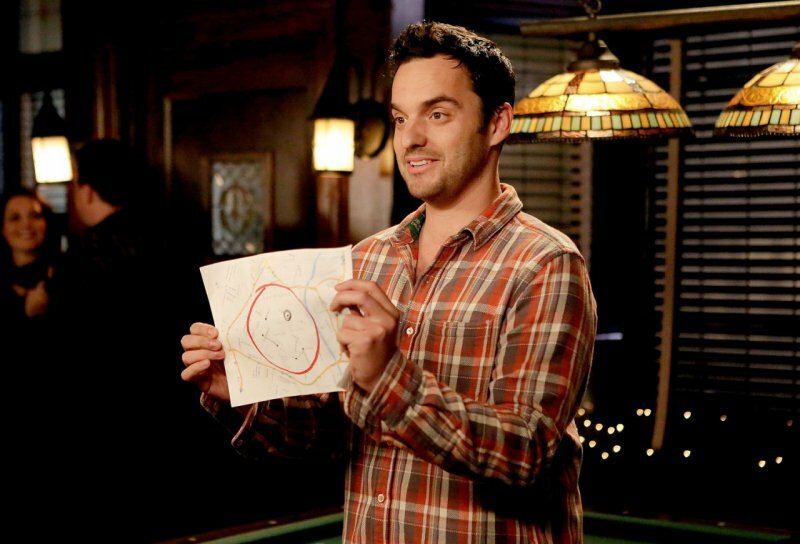 Nick Miller wants to do a bar crawl on Valentine's Day because he's determined to hit all six bars on his map, which will then (in his words) form a perfect smiley face. And though the entire episode wasn't devoted to Nick... it also WAS devoted to him. New Girl has spent its fourth season trying to figure out where Nick belongs and what his purpose is in his group of friends and outside of them. Because (as I noted in my "Landline" review) Nick seems to be coasting while the rest of his friends are out doing things -- forming relationships, moving forward in their careers, starting new ones, etc. And Nick has always been such a fascinating character to me and on this show because the truth is that he has a lot of potential and often sells himself short of it. He's smart and capable and this year he finally wants to do something worthwhile with his time. And then Kai breaks up with him. Nick and Jess broke up last year and I think that really shook Nick. I don't think he or Jess ever truly recovered from it and you can see it subtly in the way their characters are written in the fourth season. You can tell that Nick's insecurities resurfaced, his old habits of slacking off and not trying. And then when he DOES try to be a better person -- to make something of himself -- Kai dumps him. That crushes Nick because for the first time in his life, someone isn't dumping him because he isn't worthwhile. They're dumping him because he is. "The Crawl" focuses on a character trait of Nick's that has been woven throughout this series: he tries to accomplish something little because it makes him feel in control of his life. So Nick gathers his friends and tries to accomplish a six-bar crawl because it gives him the feeling of completion: a feeling that he hasn't had in a long time and that constantly seems to be getting forcibly torn away from him. Winston is the only person throughout the episode who acknowledges how close to breaking Nick really is. I love Winston Bishop. I love him more than I love most characters on any series because Winston is constantly there for the people he cares about in whatever capacity they need him to be. Since he's on call, he cannot drink during the bar crawl, but is there (with his hilariously giant backpack) to offer advice to Cece, to help ensure Nick is safe, to doll out advice (or nuts) to Ryan, to slap Coach when he's being an idiot. "The Crawl" utilized Winston Bishop perfectly. Every character trait that he possesses was on display in the most perfect way possible. He was honest and compassionate and sincere. I could write a novel on how perfect Winston was in "The Crawl," but I'll refrain. For now. Just know that Nick is constantly propped up by Winston throughout the episode, until the very end (when everyone else joins in). Nick Miller has always been such a complex, layered character in New Girl. And because we spent a majority of "The Crawl" watching him drunk, the final few moments where he stops outside of the last bar on the crawl to reflect on what he's actually doing with his life (alone) and why he's so insistent on finishing the crawl were that much more impactful than anything else in the episode. I loved the moment where Nick just leans against the railing, physically and mentally exhausted. I'll talk about what the group does next in a moment, but just know that Nick's story throughout the entirety of "The Crawl" was so great. He included so many people into the crawl because he wanted them to feel welcome -- he wanted to surround himself with "his" people (the lonely outsiders) on Valentine's Day. And I think that the fact that the group surrounded him with love at the end was so important not just to this story but to his character moving forward as well. Let's discuss the theme of timing as it pertains to Ryan and Jess and the rest of the couples in this episode. In order to discuss Ryan and Jess's relationship, I need to first talk about how "The Crawl" saw Jess come full circle from where she was in "The Last Wedding." Throughout the fourth season of New Girl, Jess has struggled to open herself back up to love after her break-up with Nick. I've talked about this extensively before, but it bears repeating: Jess was really broken after Spencer cheated on her and it took so long for her to heal from those emotional wounds. So when she finally allowed herself the chance to trust someone else and be happy again, it was with Nick. She loved him and she loved Spencer and both relationships ended (granted, under different circumstances). So Jess has spent the majority of the fourth season trying to put herself back into the dating world and struggling to open herself up and let someone else in again for fear of the relationship ending. You see that clearly in episodes like "Thanksgiving IV." So in "The Crawl," when Ryan asks Jess to move in with him, she hesitates. And the reason that she does is because there's still a part of her that's terrified to take the next step with Ryan. She's holding herself back from complete happiness and that's such a sad thing to watch her do. Because Jess deserves EVERY happiness in the world and SHE is the one preventing herself from getting that because she's scared. So in the bathroom of a bar, she and Cece make pros and cons lists about moving in with Ryan. And just like she was in "Prince," Jess rationalizes with Cece and then realizes how foolish she's been for not letting Ryan in. She loves him and she wants their relationship to grow. So she decides to move in with him. ... And then Ryan gets an offer he really can't turn down to be the headmaster of his dream preparatory school in London. And Jess is crushed because just as she finally allowed herself to be fully happy -- just as she prepared to take the step that she's been so hesitant to do -- her relationship is yanked away. The timing was off. Even though that's the case, I am so proud of Jessica Day. I'm so happy that she managed to conquer her fears of dating and of love and truly grew in her arc over the past fourteen episodes. Schmidt and Nick and Cece and Winston and Coach have been there to support and help her. They've constantly encouraged her to stop being the roadblock that comes between herself and happiness. And I love that the Ryan/Jess ending wasn't because Jess was afraid to move in. It had nothing to do with Jess's insecurities because SHE GREW AND SHE CONQUERED THEM (and that's called character development), but that the end (or seeming end, since the pair says they'll try long distance) is because of something outside of both of their controls. I think the Ryan/Jess relationship was such an important part of Jess's character development this year because this relationship was essential in her understanding that she needs to be braver and bolder and open herself up to love and to the idea of being happy, even if it means there's a chance the relationship could end. That's something she desperately needed to learn after her break-up with Nick and it was such an organic, great way to do so. In the same vein, Schmidt and Cece's story has been all about timing and though we all had qualms with how the Schmidt/Cece relationship was handled (or not handled) last year, I can say with certainty that I'm loving Schmidt's character development in New Girl's fourth season. Schmidt is dating Fawn Moscato, a local councilwoman, who uses him more like her prop than her priority. She essentially treats him like a campaign boost rather than a boyfriend and Schmidt (you remember him, right? The guy who is typically the lovable douchebag?) is so bold that he tells her what he wants in his life isn't to be someone's toy but to be their real relationship. So he walks away from Fawn at the charity event they're attending and tells her that until she can decide what she wants out of their relationship, he's done. This is such an adult move for Schmidt who, two years prior, was sleeping with his boss because he wanted something with no strings attached ("Eggs"). I love this Schmidt. I love how he's grown from pretending to not care about people to genuinely caring about them and -- importantly -- caring about bettering himself. The whole running gag this season is that Schmidt is on the path to become successful and he's trying to accomplish that by his choices. "The Crawl" is an instance in which we see just how far Schmidt has come from his days of using people casually and placing his friends at a distance. Not only does he walk away from Fawn, but he helps Cece. He holds back her hair while she gets sick and he admits (this is such an important moment) that even though it's gross... he doesn't hate it. SCHMIDT DOES NOT HATE THE IDEA OF CARING FOR SOMEONE ELSE PLATONICALLY WITH NO BENEFIT IN IT FOR HIMSELF. That is such an important statement that I had to yell it, I'm sorry. Schmidt cares so much about Cece as a person that he would rather spend hours in the bathroom holding back her hair while she gets sick than being doted on at a charity event with a beautiful woman when he knows she's using him. I love this Schmidt. I love this person who cares about himself and others so much that he's willing to prove that caring through actions. While in the bathroom, Schmidt admits that he stared liking Valentine's Day when he was with Cece. She was what made it special to him. And maybe it's the alcohol or the fact that they've been growing closer all season, but Cece begins to develop some heart eyes for Schmidt. Winston notices this when they're all back in the bar. He knows that Cece likes him or is at least starting to again. And of course, the moment that Cece lays her eyes on him, Fawn enters the bar and admits that she wants something real with Schmidt and the two kiss. Winston astutely comments that Cece should be vocalizing her sadness or anger, but she just keeps looking at the pair and you know what? I think there's a part of Cece that is crushed, sure, and there's still a part of her that realizes that this guy who is standing in the bar? The one who held her hair back? He's not the same person from a year ago. She LIKES this Schmidt. But I think the most important takeaway from the Schmidt/Cece/Fawn storyline is that sometimes the timing is off... and that's okay. Sometimes things are worth waiting for. And I feel like Cece is going to wait and let her feelings grow again for Schmidt before she even thinks about doing anything. That's why she's okay. During the bar crawl, Coach meets a woman named May at the first bar. He tries to hit on her but it's lame and cheesy and she pushes him away with good reason. And then... the two keep running into each other. At first, they're irritated, and they have every right to be. But then, something happens: Coach and May actually begin to converse and they realize that this isn't the first time they've narrowly missed each other. They're both Army brats and have been living in the same places, just at different times. It's such a strong and genuine connection that it kind of startles Coach and he does what he always does when things get too serious -- he pushes May away. We haven't seen as much of Coach's journey as we have Jess's and that's understandable -- he's not the main character of the series. But Coach and Jess had similar journeys, remember: Coach and his long-time girlfriend broke up and it totally wrecked the man. He's spent so much time trying to push away that pain by having casual relationships with other people but he's realized that's not working for him. He finally met a girl who he seemed destined to be with and it terrified him much like being in a relationship terrified Jess. May is not an easy option for Coach -- May is the start of something real. And Winston's slap reminds Coach that he's being an idiot for letting something that could potentially be great slip away just because he thinks he's not ready for it. Coach comes to his senses and May agrees to give him a chance... if he's willing to work for it. Their relationship is already so adorable and I'm completely on board with it. In regards to the theme of timing? This is perhaps the best story in the entire episode about it. Sometimes, the best things in life happen when you're not anticipating them to. Sometimes people show up in your life and mess with your timeline... even when the timing has been off for you for a long time. "The Crawl" ends with the best love story possible: the one between the entire group. As Nick pauses outside of the final bar, Jess exits and asks what's wrong. Slowly, the rest of the gang filters out and they all begin to comfort and encourage Nick. They love him. He isn't a failure and he isn't aimless. He's getting his life together one piece at a time and he's valuable to them. But Nick cannot enter the final bar -- cannot finish the one thing he intended to -- and is discouraged. That is, until Winston Bishop (MVP of this entire episode) and his backpack exit and Winston brandishes two six-packs. They'll have their own celebration. "The Crawl" is one of the funniest and best episode this season, hands down. I absolutely love Kim Rosenstock though so I wasn't surprised that it was. (She was the one who penned "Birthday" and "Menzies," after all, arguably two of the best episodes this show has ever done, ever.) I loved all of the stories and how seamlessly they wove together. Everything was beautiful and perfect so thank you, Kim. "The six bars form a perfect smiley face on the map." "... Did the music just get louder?" "I'm gonna need you to look as Mexican as possible." Max Greenfield krumping is literally the best and most hilarious thing I will ever see on this show. Ever. "I thought I could skip the question and come back to it later. Which is the strategy I taught my SAT prep class." "Hair blocks sound." WE THEN GOT A FLASHBACK OF NICK AND JESS'S RELATIONSHIP. "Have you gotten a chance to read my Walking Dead fanfiction yet?" "I WANT CHICKEN WINGS." Drunk!Cece is my new favorite Cece. "Write a good email and I'll go out with you. I'm talking full sentences, no typos, no pictures." "You're like the black Marry Poppins!" Coach and May are seriously like, the sweetest couple ever. And yes -- watching their mini rom-com unfold was so satisfying because Coach hasn't had a decent girl in a long time and I feel like he deserves it. The Ryan/Jess dissolution was inevitable (is he the longest relationship on the show apart from Nick? I feel like yes) but I love that they handled it in a way that was growing Jess as a character in the process. "The Crawl" was such a delightful episode and I genuinely feel like this season is quite stellar. Thanks for your comment, anon!